At Scottie & Son YOU are in charge! We pride ourselves on our dedication to customer service and in providing excellent automobile maintenance, repairs and body work. You need an auto center you can trust, with professionals who know what they're doing. With decades of experience and multiple talents, the team at Scottie & Son has the expertise to complete every repair right the first time. We are "The Team You Can Trust." 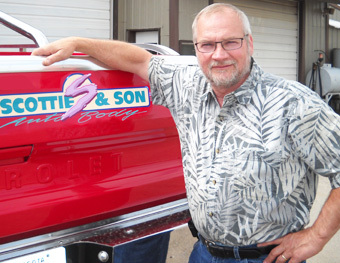 Robert M. Scott (Scottie) started his business almost 40 years ago in 1979. He knows cars! Scottie is a mechanic, auto body repairman, and vintage car restorer. Working on cars is his passion. Scottie knows how important it is to keep family vehicles safe and in top running condition. He's been married for 24 years and is the proud father of 5 children, grandfather to 15, and great-grandfather of 8. 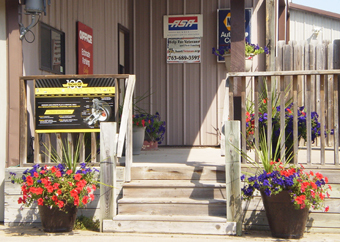 Scottie & Son Auto Center welcomes you. Stepping into the family business in 2004, Rian is Scottie's right-hand person. Rian is Scottie's daughter-in-law. She manages every aspect of the office and is usually customers' main contact. Rian works closely with the mechanics and body shop techs making sure every job is done right and on time. The mechanic and body shop experts at Scottie & Son take pride in their work and strive to do everything as if for their own family - at a price you can afford. From routine maintenance to complete restorations, Scottie & Son has the skills and knowledge to keep your car safe, dependable and beautiful!